Astronaut photograph ISS053-E-127736 was acquired on October 23, 2017. 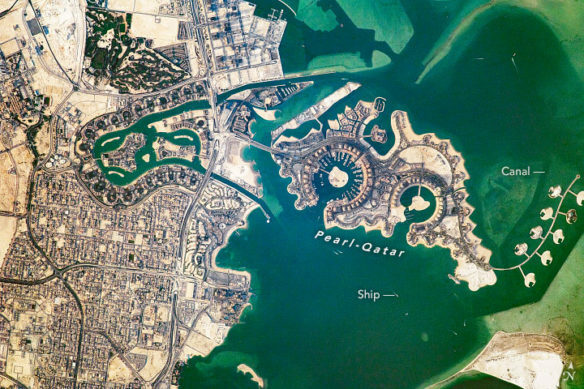 An astronaut flying aboard the International Space Station took this long lens photograph of part of Doha, the capital city of Qatar, located on the northeastern coast of the Arabian Peninsula. The Pearl-Qatar infrastructure was built to resemble a string of pearls in recognition of the historical pearl-diving sites upon which the island complex is built. The proposal of the artificial islands started in 2004 and comstruction is expected to end in 2018 with ten precincts, 31 towering buildings, and 4,700 apartments. With more 2 million inhabitants, Doha is a center of economic activity for the region. The city will host the FIFA World Cup in 2022, the first time the soccer tournament will be held in the Middle East. With this large population and a push for tourism comes challenges in finding sustainable supplies of drinking water. Qatar has an arid desert climate with hot, long summers (March to September), and annual rainfall is scarce and unpredictable. The Doha Groundwater Basin sits below the city and is mainly used for irrigation. In consequence, the city is turning to desalination of sea water to supply potable water to residents.